On June 15, 2016 a severe thunderstorm event took place in Wisconsin. The Storm Prediction Center had indicated a "Moderate Risk" for severe thunderstorms that afternoon. Short range forecast models consistently showed a lone, powerful supercell thunderstorm moving through central Wisconsin during the afternoon. Many storms formed that afternoon, but that lone supercell predicted by models drew the most attention. It lumbered slowly from Black River Falls, WI southeast to Port Washington, WI with many severe weather warnings. Storm chasers from across the continent were there in addition to most state-based chasers. It was a beacon; everyone and their mom was there. "This is too easy..." I said to Chris as we left Stevens Point eagerly looking north for an alternative.Finding no alternative at the time we intercepted this storm near the Wisconsin River, chased it continuously to Princeton and let it go. It was an average storm with only slightly unique appearance. We left it in a state of decrease and conflict and though it would go through cycles of intensity thereafter, we felt slight disappointment. The storm did not live up to the hype.In the minutes, hours, days after photography began to emerge depicting the storm in an unrealistic manner. Contrast, color, tones shifted making the image appear far more dramatic with words like "incredible" and "amazing" appended to the description. People commenting on the photo with praise such as "Amazing colors! Incredible capture!". We laughed like usual at the spectacle. It's amazing the stretch some will make for attention but I could see a trend. Whose was setting the example for future storm chasers?The hobby of storm chasing has come under intense scrutiny in recent months. Aggressively written stories that leave the readers questioning the integrity of our hobby. The real intent is only to inspire debate, bring about positive change for the future. Two weeks ago I shared the following image on our facebook page, Wisconsin Weather. The discussion on Faketography originally began on our podcast a few days earlier. Faketography is a deliberate attempt by photographers to distort reality of a real event for personal gain such as money or attention. This is made possible by post-processing software such as Photoshop which lets photographers easily enhance, distort, or change an image to reach a desired appearance. Some photographers desire the image to appear as it was observed to the naked eye while others seek to mask that reality; what I call art. The issue arises when faketographers fail to make the distinction between art and reality when sharing with their audience. 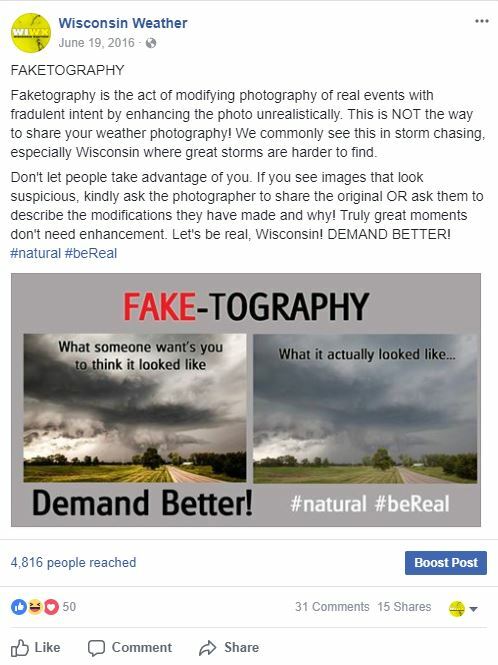 The fakephotographer shares their image by uploading it to the internet describing it as reality. Some often taking it one step further by exaggerating what they witnessed. There are some exceptions, such as during night photography when the human eye struggles to see light. It seems that standard now is for storm chasers to exaggerate their photography, observations, and experiences as much as possible. If you don't exaggerate you become secondary, undervalued, and underappreciated. For those just starting their chasing careers, this can be suffocating. Being real and honest is not the priority and I'm not sure it ever was. It is impossible to equal or exceed someone who fakes their photography and shares with an exponentially increasing audience that doesn't know the difference. The distorted, viral illusion created by the photographer grows while the truth dies.Our facebook post two weeks ago was an opportunity for a multifaceted social media and community experiment. We intended to inspire debate and educate our audience. I took one of my own pictures, moderately edited it to demonstrate the point, t hen compared it against how the storm really looked. With hundreds of Wisconsin thunderstorms forecast, intercepted, and documented; we know what Wisconsin storms are supposed to look like. We've been on both sides of the faketography spectrum having enhanced our photos occasionally in our early years of chasing. This insight cannot be gained alternatively.So If there was anyone qualified to carry out this discussion, it was us.OBSERVATIONSThe idea that right or wrong even exists can be debated. The argument of right vs. wrong does perpetuate rules, order, and law in society. What we know about the modern society is that fraud; deception for financial or personal gain is wrong. It's damaging to the fraudster, but it's much more damaging to the victims. Fraud is punished heavily by law ESPECIALLY when money is involved. Have you heard of Bernie Madoff, the Wall Street stockbroker who deceived investors into his ponzi scheme?Not everyone agreed with our post. It was written to a small audience of 5000 subscribers, some of the negative feedback derived from poor word choice on the initial post. The verbiage was left loose, somewhat carelessly written, perhaps more harsh/dramatic than it needed to be in order to invite people into the discussion. I spent many hours in discussion with those who disagreed with my point of view. The negative feedback was expected and welcomed. The words of the post may have led some photographers to feel as if they were being attacked. The counter point was something we absolutely needed to hear!We assume that most if not all negative comments and response came from outside our page audience. This could mean several things; our audience has chosen us specifically for the content we provide (which is good). If a certain facebook page is the only source of information on that topic for that user, they cannot see other perspectives (tunnel vision and box propaganda). Most of the negative comments came from facebook users who were not in our target audience, knew nothing about us, and only caught wind of the story through sharing of the post and coincidentally disagreed with our point of view. The vast majority were people who had never interacted with us personally, with our page, and after the post never will interact with us again. It could also mean that our adversaries, unsubscribed and ignorant felt the need to direct negativity our way. Perhaps there were some who were neutral on the topic to start who were drawn in by the discussion; which I would consider a win whether they agree with us or not.In all cases we tried to treat everyone equally. Some were simply focused on enticing an emotional reaction rather than having an intellectual discussion. Some arguments were exploratory; throwing darts and dartboard hoping to strike an artery. This is why it is important to think objectively in discussion removing all emotional and personal bias. It gave those with a guilty conscience the opportunity to come clean but mostly vengeful individuals looking to clean our clock. This supports the ideology that society naturally has an affinity to destroy differences. If it doesn't support what's popular or question's what you believe, it must die. Our society is becoming increasingly intolerant with rise of social media. It is a virtue to question things! Our team has always treated public opinion with a sliver of skepticism. Given our experience and ability to act without strings attached, we are free to do and think what we want. Constantly going against the grain is not the must efficient way to spend your time, but if you don't stand for something you will never stand for anything.The Greek philosopher Socrates theorized "The only true wisdom is in knowing you know nothing." If this observation were to be considered true, then we would have to assume the only way to get to the true answer is to look outside yourself. By asking others what they know. If they truly know what they are talking about they will teach you something. If they don't know what they are talking about; their alter-ego will frustrate and flounder. I follow the Socratic Method closely; I don't try to know everything but I strive to know enough to ask educated questions.The good news is that our experiment was met with mostly positive reviews. Whether they agreed or not, our audience was educated on the topic via critical thinking, counter points, and discussion. We demonstrated that it is okay to ask questions and stick up for yourself. Our page likes increased; clearly "likes" are not why we do what we do but it is a measure of how it is received. As part of the experiment, we did not share our post on Twitter. The image found it's way to twitter via third party and broadcast in support of our opinion. It was received well if not better on Twitter. In general, those who shared our perspective recognized the war we waged and were supportive of our mission.CONCLUSIONSWe learned many things from our discussion that changed my perspective. Faketography is a polarizing topic. It was important to make the distinction that not all Photoshoped images are fraudulent, but most fraudulent photographers use Photoshop. Not all enhanced images are fake but most fake images are enhanced. It was a common strategy of those seeking only to win the "argument" to carelessly flip these relationships around, take them out of context, or take the discussion off the rails. I learned the most from those who spoke from experience and treated us with respect even though they may have felt personally attacked by our post. Perhaps they understood what we were trying to do. Thank you again!The most important distinction was that photography is art, not factual reality (science) and that's the point. Coming from the science perspective it's hard to accommodate the possibly that one thing can have multiple explanations. For example; it may be one tornado but there are multiple ways to produce it. It's an abomination of sorts. Science uses photography to document and study. Thankfully art runs in the family; I understand creativity most than my critics would give me credit for. People physically see things differently. The experience is unique to them. I could be standing right next to you and see the same cloud differently. There is room to flex and bend. This is something that should be accentuated and encouraged! The beauty that can be brought out of an image through post processing is truly spectacular. Some storm photographers like to edit the storm they way they felt it. That is absolutely incredible!I am not an enemy of Photoshop. Matter of fact, I understand it quite well and use it often. I take pictures in RAW format because the picture as-shot is almost never perfect. Part of the process is to convert to .jpeg format, I use Photoshop for that too. While I'm in there I think back to my mental images of the moment I took the photo. If it doesn't add up or make sense I fix it. I couldn't preserve my peace of mind let alone integrity if I blew the doors off with 100% sharpening factor. As one photographer commented on our facebook post, "moderation.moderation.moderation...". Some people just take it way too far.I believe the issue with faketography centers around the photographer and the choices they make. Some who disagreed with our post were quick to point out that it's the viewers fault for looking at their images! If you don't like it look away. Wow. Unfortunately this ignorance perpetuates and perhaps partially explains the reasoning behind faketography. Yes it is a free world, yes you are free to be who you want how you want. You have rights, I have the right to tell you don't have the right to mislead others. This is especially true when you have moral obligation to do the right thing! 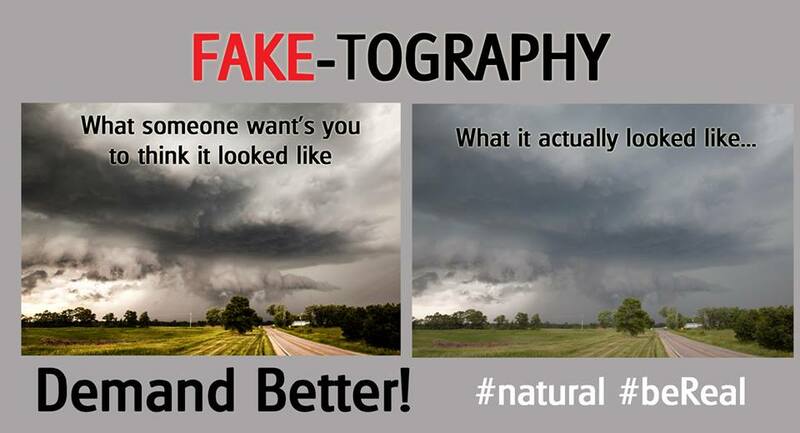 #bereal dawg!Storm chasers usually become faketographers when they fail to indicate to their audience that the image they enhanced was not how it truly appeared. YES, you NEED to make this distinction because your audience has no way of making the distinction on their own. A storm chaser with a trained eye will know the difference and might actually support your creative vision. If you HDR and edit your photography so severely that you destroy it, then most chasers will balk at it. You don't have to explain yourself to us (I do appreciate it because it helps me learn), explain yourself to your audience! Your audience may not know what the cloud is suppose to look like. Some of the biggest opponents failed to understand that it's not about the photographer, it's about everyone else!If you like over-processing your photos for personal gain irresponsibly, think about your audience. Put yourself in their shoes. The young kids who are looking up to you. The adults who look to you for trust and guidance. The storm chasing community that is counting on you to advance the hobby in a positive way. Your colleagues, friends, family who have trust in you. These are people you need to think about. Moreover, distorting an image too far is one thing. To follow up with inflammatory verbiage is another. Given the opportunity to get it right, the faketographer instead pushes the deception further. My goodness, why? What purpose does this serve? ?It is extremely important to science, the National Weather Service, SKYWARN groups who value education and clear/accurate communication. They need to get it right because the science, history, and future depends on it. They have to teach kids, adults how to understand weather. There is no time, no room, no need for faketography. The more distorted images you upload the less trusted you will become. There is a place for enhanced photography in science; such as when used to reveal a specific feature of the storm. This can be an opportunity to learn but only if you accurately describe your observation! If you are worried about your observation being incorrect, flimsy, or a stretch share it with someone with experience. Communicate!STORM CHASERSTo the storm chasers in the audience; you have accomplished many things. Those who have waged war on our hobby fail to understand the contributions we have made. You have an advanced understanding of meteorology, navigation, communication, and networking. Where there is a need, you've fulfilled it. You've created vehicles to withstand tornadoes. You've witnessed the raw and true power of nature. Your passion has created new technologies!The one thing you haven't created is a leader.Naturally, storm chasing is chalked full of Type A personalities out to rule the world. The division of power at the top is in someways a gift but you have no direction. If you want to truly do some good, get a leader that will show you the right way. We lost three great leaders in 2013 who led by example. Now I fear we are stuck with people who are out only to make a name for themselves. That's all I hear about anyway.For the kids, teenagers, young adults discovering storm chasing for the first time; understand that life will not be easy. You must be patient, kind, respectful, accurate, honest, and articulate. You need use your observations to tell it like it is, not what you wish it to be. Be real and be yourself. Attention is meaningless and intangible. Seek personal growth. If you see someone popular doing things a certain way, try something different and get really good at it! Think outside the box! When it comes to safety and strategy, listen to what the experienced chasers have to say. Better yet, chase with one to learn how!. Do the research. Take the time to understand. Never settle for the easy answer.I personally encourage chasers to use their passion into other aspects of life. Use it to grow your perspective, to see the world, to understand things, educate and teach others. Don't use it to pad your checkbook or grow your facebook page; think of your profits as an after dinner mint. You will find the hobby of storm chasing to be multi-dimensional; the connections you make can span the length of time if you want them to. Over several years of chasing when you finally discover what it is that makes you happy, do it and do it the right way! If you plan on take pictures of the storm, never feel like you need to distort reality. Mother nature is beautiful just the way she is and there will ALWAYS be people out there who appreciate the natural beauty. You are capturing a moment. You cannot create great moments, they must be created for you and they only come once in awhile. Live for those moments.